Various inherited and acquired hematopoietic disorders are characterized by macrocytic anemia, in which red blood cells are abnormally large with insufficient hemoglobin, and evidence of dysfunctional erythropoiesis. While multiple etiologies have been implicated for the development of these disorders, many cases of abnormal blood cell production have no discernable cause. Vijay Sankaran and colleagues at Harvard Medical School identified a female with a macrocytic, dyserythropoietic anemia that had been present since childhood. Moreover, the mother and sister of the affected individual also presented with macrocytic anemia, suggesting an underlying genetic cause. Whole exome sequencing of the three affected family members and one unaffected member revealed the presence of a mutation in one allele of the X-chromosomal gene aminolevulinic acid synthase (ALAS2), which encodes an erythroid-specific mitochondrial enzyme required for heme biosynthesis. Enzyme kinetic analysis of WT and mutant ALAS2 showed that the mutation impairs binding of an essential co-factor, resulting in a loss of function. Surprisingly, the severity of the anemia phenotype was not associated with severe skewing of X-inactivation toward the mutant allele. Instead, cells expressing the mutant allele exhibited an early block in erythropoiesis, leading to perturbed erythropoiesis in cells expressing the normal allele. This study identifies an X-linked dominant mutation in ALAS2 that perturbs normal erythropoiesis and supports the use of whole exome sequencing as a tool for characterization of disease etiology. The accompanying image shows bone marrow from the individual described above with macrocytic, dyserythropoietic anemia. Citation Information: J Clin Invest. 2015;125(4):1665-1669. https://doi.org/10.1172/JCI78619. Macrocytic anemia with abnormal erythropoiesis is a common feature of megaloblastic anemias, congenital dyserythropoietic anemias, and myelodysplastic syndromes. 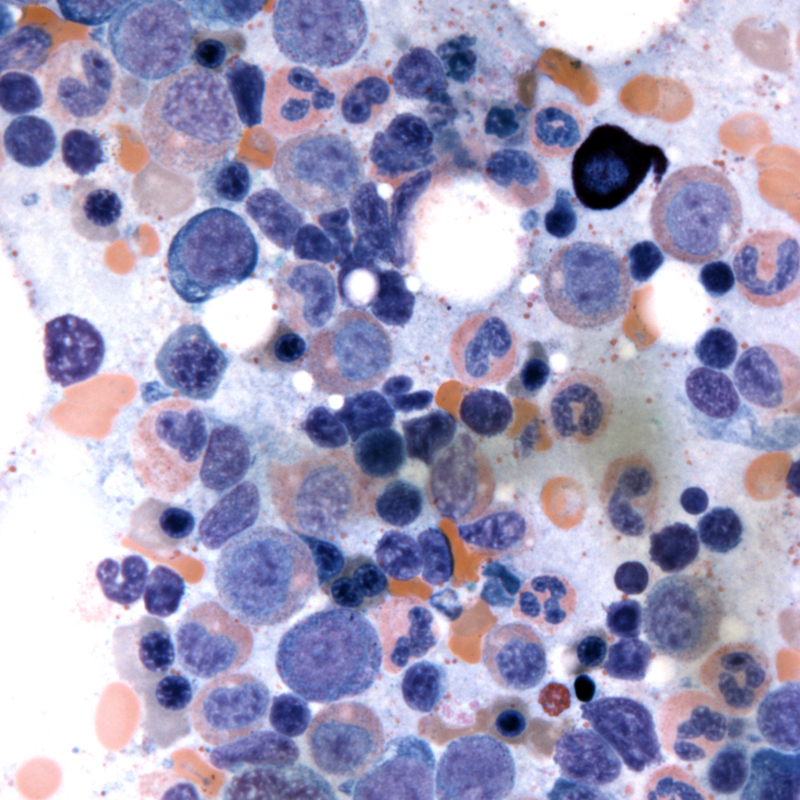 Here, we characterized a family with multiple female individuals who have macrocytic anemia. The proband was noted to have dyserythropoiesis and iron overload. After an extensive diagnostic evaluation that did not provide insight into the cause of the disease, whole-exome sequencing of multiple family members revealed the presence of a mutation in the X chromosomal gene ALAS2, which encodes 5′-aminolevulinate synthase 2, in the affected females. We determined that this mutation (Y365C) impairs binding of the essential cofactor pyridoxal 5′-phosphate to ALAS2, resulting in destabilization of the enzyme and consequent loss of function. X inactivation was not highly skewed in wbc from the affected individuals. In contrast, and consistent with the severity of the ALAS2 mutation, there was a complete skewing toward expression of the WT allele in mRNA from reticulocytes that could be recapitulated in primary erythroid cultures. Together, the results of the X inactivation and mRNA studies illustrate how this X-linked dominant mutation in ALAS2 can perturb normal erythropoiesis through cell-nonautonomous effects. Moreover, our findings highlight the value of whole-exome sequencing in diagnostically challenging cases for the identification of disease etiology and extension of the known phenotypic spectrum of disease.